Faced with 25 open paramedic positions and no qualified candidates on file, Mobile Medical Response (MMR) turned to the Talent Experts at Great Lakes Bay Michigan Works! last year for help. The result? An accelerated emergency medical technician (EMT)-to-paramedic training program that pays students to train. A model for success, the program was nominated for the 2017 Michigan Works Association Impact Award. Like many employers in the region facing shortages of qualified workers, MMR determined the best option is to “grow our own.” Collaboration with GLBMW! to develop the pilot program was essential, Myers explains. Paramedic training takes 12-14 months. Before becoming a paramedic, students must first be licensed as EMTs and work shadow with paramedics. GLBMW! not only helps MMR earn Skilled Trades Training Fund (STTF) grants for the program, it also provides MMR with help recruiting, screening, and on-boarding candidates for the initial 7-week EMT training and certification. Successful candidates are paid to train, allowing them to focus their attention on their rigorous studies. Once licensed, students are hired as EMTs by MMR and begin working and gaining valuable experience, while also taking the paramedic course. MMR’s first pilot program netted 12 certified and licensed EMTs, nine of whom enrolled immediately in paramedic training. This opportunity is life-changing for students – many of whom are underemployed or unemployed – AND game-changing for their employer. “This program gives us the ability to find hope in a desperate situation,” Myers says. MMR was one of 49 employers awarded STTF funds in 2018. “Our hope is to expand the program this year, taking lessons learned and grow the concept,” Myers explains. MMR paramedics earn $42,045 to $65,500 annually. This wage, coupled with generous health care, insurance, education and fringe benefits, creates a solid career path for those looking for a long-term health career. MMR will continue to work with GLBMW! to attract qualified candidates for the program, using several communications vehicles, including social media. MMR is a private, non-profit, full-service medical transportation company formed in 1994, serving 15 counties throughout mid and northern Michigan and employing nearly 650 employees company wide. 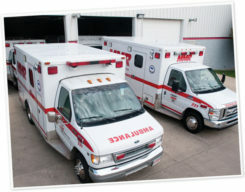 MMR is the only provider of EMT and paramedic training in the region, ( facilities in Saginaw and Mt. Pleasant) with the exception of two hospitals that provide training exclusively for their personnel needs.